~It can hold a larger phone without having to remove the case. ~ The easy to tighten head with the nifty piece allowing you to not have to spin the stick or the mount. ~Is bluetooth so you don't have to worry about using an adapter with it to plug into the headphone jack with waterproof cases. ~ Uses a wide charger cord that is widely available if you lost it you probably have others laying around. ~ Have to remember to charge it. I think the plus outweighs the cons on this one, BUT thats just me. 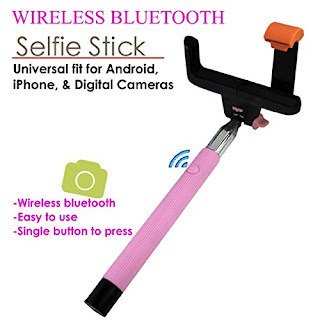 You can find this device on Amazon.